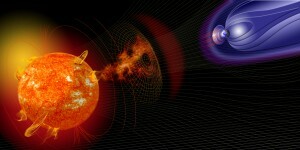 The new initiative-level selection, “Space Weather Technology, Research, and Education Center,” features collaboration between LASP Director Dan Baker, LASP Atmospheric Scientist Cora Randall, Jeff Thayer (Department of Aerospace Engineering Sciences), and Nils Halverson (Department of Astrophysical and Planetary Sciences). This proposal seeks to establish CU Boulder as the world’s leading university in space weather by establishing the Space Weather Technology, Research, and Education Center (SWx TREC). Space weather poses a significant threat to humans working in space, modern ground-based technological systems, satellite operations and observations, communications, navigation, airline operations and more, which results in significant societal, economic, national security, and health impacts. CU Boulder already houses many leading researchers, educators, and technology developers in space weather. The state of Colorado is a national hub for space weather activities, including partners at the High Altitude Observatory (NCAR), the Space Weather Prediction Center (NOAA), the National Solar Observatory (NSF), and a number of industry partners, including Ball Aerospace and Lockheed Martin. Baker has led LASP’s involvement in NASA missions researching the Van Allen radiation belts and the fundamental processes of magnetic reconnection in near-Earth space among other aspects of space weather and space physics. “Our entire team of experts on Space Weather at LASP is excited to be part of this Grand Challenge program at CU-Boulder,” he said. “We have long believed that helping to safeguard our nation and its technological assets is basic research with a high public purpose. We intend to work locally, regionally, and nationally to use our experience and skills to make this Grand Challenge uniquely successful. A Grand Challenge project-level selection, “Magnetic CubeSat Constellation for Advanced Navigational Models,” will be directed by Robert Marshall (Aerospace Engineering Sciences). This project leverages the combined expertise of LASP, CU Boulder’s Ann and H.J. Smead Aerospace Engineering Sciences department, and the Cooperative Institute for Research in Environmental Sciences (CIRES) Geomagnetism Team for the development, construction, testing and flight of the first ever CubeSat dedicated to the efficient and economical collection of high-resolution magnetic field data. The other project-level addition, “Nature, Environment, Science & Technology (NEST) Studio for the Arts,” is led by Erin Espelie (Film Studies) and Tara Knight (Critical Media Practice). NEST is a network of faculty, students, centers and campus units that combine artistic practice and scientific research to explore our common and disparate ways of observing, recording, experimenting and knowing. A series of cross-campus initiatives will allow students to directly engage with faculty mentors and inspire alternate modes of communicating with the larger public. To facilitate undergraduate learning, NEST will work with faculty to showcase existing courses and develop curriculum that engages these central questions, operating upon a “nested” model that scales from the microscopic to the cosmic. The response to the call for proposals was impressive, resulting in the submission of six initiative-level proposals and 18 project-level proposals. The Grand Challenge Review Panel comprised of both internal and external members—including academic, industry and government perspectives—evaluated the proposals. The evaluation was based on the following criteria: innovation, transforming our campus, sustainability, and impact. Recommendations were then submitted to Grand Challenge and university leadership for final endorsement. Principal investigators for these projects have been encouraged to continue dialog with Grand Challenge and the CU Boulder Research & Innovation Office (RIO) leadership to further develop the projects and explore additional opportunities for collaboration, funding and support. The Grand Challenge: “Our Space, Our Future” fuses CU Boulder’s unique strengths in earth, space and social sciences with new technologies and partners to address the pace and pattern of changes for our environment, our resources and our planet.